"Fragile, handle with care," is what many packagings advise to protect the contained fragile goods. But how do you protect sensitive powders and liquids from unwanted physical or chemical modifications? 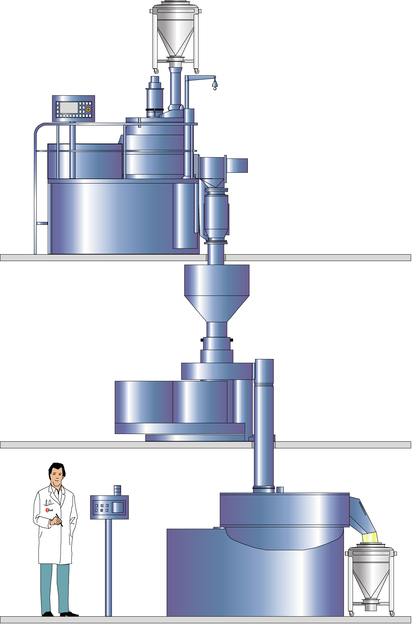 While granulation or encapsulation can produce highly stable product forms, some technologies apply significant stress, for example high temperatures or pressures, on the ingredients during processing into the finished granules, leading to inferior product quality or diminished activity. A common task of product developers is therefore to find a technology to refine raw materials or formulate new product variants that minimizes such processing losses of the contained, valuable substances. Wet extrusion in a low-pressure extruder is a comparatively gentle processing technology that is well suited for temperature-sensitive substances such as enzymes, vitamins and many APIs. Compared with the widely used dry compactors and screw extruders, the basket extruder operates under far lower pressure. The extrusion mass is moistened in a mixer and then driven out by rotating tools in alternating surges through the basket extruder’s perforated cylindrical die, the basket. Cooling and lubrication are achieved by the moisture present in the humid mixture and in the extruder, so processing does not lead to any substantial increase in temperature. The hole size of the extrusion basket essentially determines the particle size distribution of the eventual product, with typical die hole diameters ranging from less than one to about three millimetres. The emerging substance strands break and decompose into cylindrical pellets. If necessary, these can be formed into spherical pellets before the ensuing final drying step. This ultimate step is ideally performed in a fluidized bed system because, despite the intensive transfer of energy and mass, the material to be dried moves very gently and it is possible to precisely control the residual moisture content. Although not applied very much, low-pressure extrusion has been an established technique for many years. Large-scale users, such as the IPC Process-Center GmbH & Co. KG in Dresden (Germany), have gathered extensive experience in a wide range of applications. Numerous product forms have come into use in a wide range of industries, including detergents, feed additives, food, food supplements and medical products. The technique has many benefits. The dried pellets are uniform in size, dense and possess a defined shape. The product is dust-free and displays good flow characteristics. The low surface-to-volume ratio is ideal for adding a surface layer by means of fluidized bed coating. Coating can improve protection against moisture, help to increase product stability and visually enhance the product. 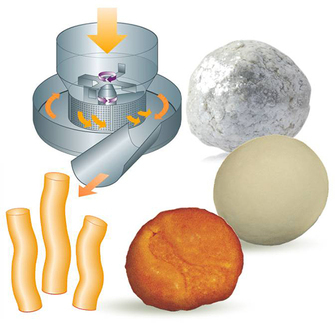 Controlled pellet degradation or release properties can also be achieved. In addition, making products safer for the user is constantly gaining in importance.